As it turns out, once a walrus settles in for a nice long soak, it's pretty darn hard to get him out. What's a family to do? 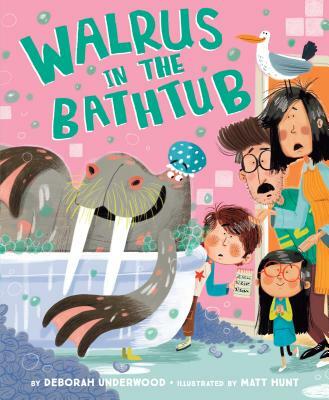 This silly-sweet story will keep readers giggling as a family tries--and tries again!--to evict their unexpected houseguest... before finally realizing why he's there in the first place. Deborah Underwood is the author of several picture books, including the New York Times bestseller The Quiet Book; Bad Bye, Good Bye; and her Cat series, which began with the New York Times bestselling Here Comes the Easter Cat. She lives in San Francisco. Matt Hunt spent his childhood in the historical county of Worcestershire, England. He holds a degree from the Birmingham School of Art and now lives in Redditch with his wife, and two cats.